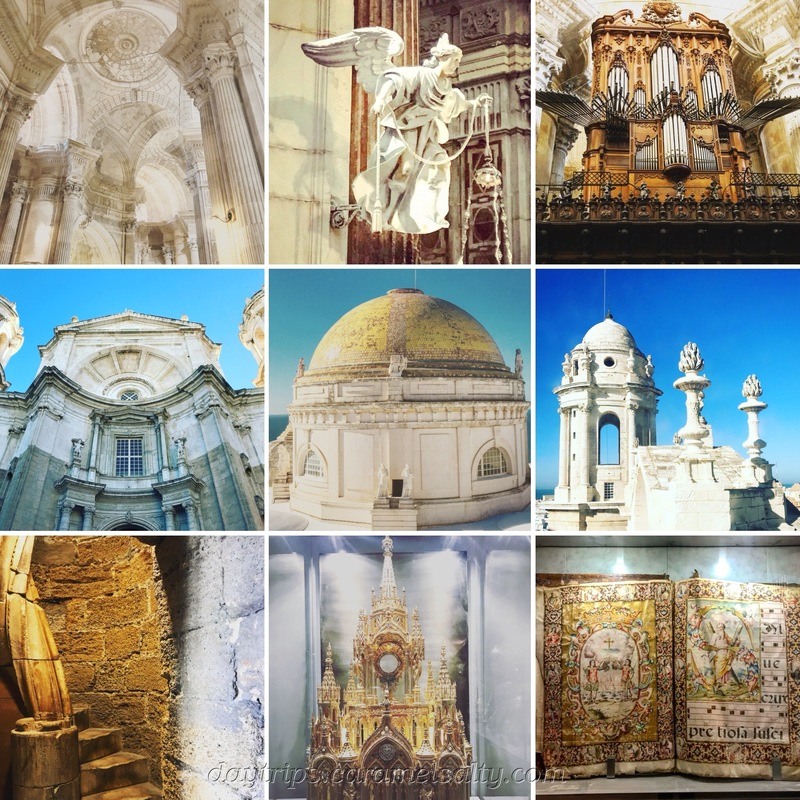 As Cadiz is one of Europe’s oldest cities, my first daytrip to Cadiz is going to step back in it’s history . So fittingly, my choice of public transport today is by water. Start of Day Trip: El Puerto’s ferry terminal (look out for the porta cabin by Bodegas Gutiérrez Colosia). It’s only 30 minutes (3 Euros each way) on the very calm ferry trip. As I approach Cádiz, I sit on the upper deck scanning the skyline that hasn’t changed much since the 19th century. However I can only recognise the cathedral’s dome. On exiting the Terminal Maritima Metropolitana Cadiz, my first port of call is Muralla Puertas de Tierra. It’s the Age of Discovery (15th century) when Christopher Columbus discovers the Americas and a lucrative trade route ensues. The booming population overspills from the medieval city into the Santiago district and have to be protected. The stone version I see today was commissioned after the original earthern one was easily breached during the sacking of Cadiz in 1596 by Anglo-Dutch troops. The museum at the tower, accessible from the central arch, has an interesting display of old maps and archive pictures of the bridge. The wide open terrace at the top, whilst requiring some TLC, affords me some fabulous views of the harbour. The view of the open sea from the other side is somewhat obscured by buildings. The striking yellow and white Iglesia Conventual De Santo Domingo which has a beautiful altarpiece of Genovese marble. I make a note of the church tower, as I will recognise it as I sail away on the ferry. The Hotel Convento Cadiz’s chapel-like reception, built into the side of the Santo Domingo. The green and white facade of the Iglesia Santa Maria as I wander up the narrow Calle Santa Maria. I arrive at Museo de Casa America, (1836, prison). I am bemused. I usually associate prisons with barbed wires, watchtowers and unscaleable walls. A handsome neoclassical building with marble stone floor is as far away from a prison as can be, but Wikipedia assures me that it is. Today, though, it’s an immersing contemporary art museum, featuring many South American artists and Zitman’s excellent exhibition of sculptures of the female form . And from the port windows in the upper gallery, I get a glimpse of what delights await for me outside. And it’s to the outside of the prison that I rush to when I’m done, for a wonderful sweeping view of the bay. I can see all the way to the Castillo de San Sebastián to my right, which I explore tomorrow. I head along the coastal Avenue Campo del Sur, admiring the rear views of the cathedral. But just before the cathedral, I dive into Calle de San de Dios for Arco de Los Blancos, the first of the 3 medieval city gates on my walk today. I can still clearly make out the old city walls on either side of this arch. Through the arch is the Teatro Romano de Cadiz (built 70 BC). Unlike other Roman amphitheatres, this has excellent exhibits and a video explaining the social and political impact of this theatre during the rule of the Romans in Cadiz. Very well done indeed. Plaza San Martin, with an unoccupied, but pretty rose pink building. The small and free Sala de Expocisiones El Pópulo in the same square exhibiting paintings of scenes of Cadiz. Plaza Fray Felix for the Parroquia de Santa Cruz. Its plain stone work interior is a stark contrast to all the other churches here. Arco de la Rosa, the 2nd gateway into the old city. Arco de la Rosa leads me into Plaza de la Cathedral and my first sight of the jewel of Cádiz, the Cádiz Cathedral. First I visit the cathedral. It’s vivid, cavernous white marble interior is somewhat marred by the overhead netting. But I am grateful as it’s evident that it’s doing a good job in protecting me from falling debris. My best bits of the cathedral are the choir and the organ, and the fact that it took over a 100 years to build. Next I visit the crypt. By crypt standards, it is warm, clean, well lit and perfectly circular. When I stand in the centre and say “ooooh” (yes, my imagination was running riot at that moment) to the ceiling, I am rewarded by a wonderful echo. The musician Falla is buried here . His music was influenced by Andalucian flamenco.Intrigued, once outside, I listen to his El Amor Brujo. It’s time for lunch. Today’s choice is the Restaurant Marisqueria Las Flores 1, Plaza Flores, which describes itself as a Freiduria. Amongst the sea food tapas I order, is the famous tortilitta de camarones. A must have if you are in the Province of Cadiz. Museu Catedralico‘s red, blue and white striped tower. This is another landmark visible from the departing ferry. Parroquia de Santa Cruz‘s shiny blue grey domes on the flat roof next door. Torre Tavira‘s pink and white tower, with flying flag. Oh yes a word of warning. The bells will ring on the hour. Very loudly. Be prepared for the din. And don’t be leaning over the edge when it does ……. Next it’s the Museu Catedralicio. The audio guide is worth listening to closely. In between the boring bits about bishops, are little gems like a very descriptive account of the 1596 Cadiz attack (Room 4) and the story of the sculpture of 1,000,000 pieces of jewels (Room 10). I return to the ferry port via Arco de la Rosa, Calle Pelota, Arco del Populo, (the 3rd gateway into the city) towards the Ayuntamiento and down Plaza de San Juan de Dios. I stand on the upper deck as I depart Cadiz, looking at a more familiar skyline than I recognised this morning. I sail back to a glorious sunset at El Puerto, looking forward to tomorrow’s adventure back there.